The Armenian Church of America was established officially by Catholicos Mkrtich Khrimian in 1898. The Church has two dioceses in the U.S: the Eastern Diocese—known officially as the Diocese of the Armenian Church of America—has jurisdiction over all of the United States except California, Washington, Nevada and Arizona. The Western Diocese, consisting of the above western states, was constituted in 1928. There are 63 organized and mission parishes in the Eastern Diocese. A third diocese governs all of Canada. The head of the Eastern Diocese is the Primate—V. Rev. 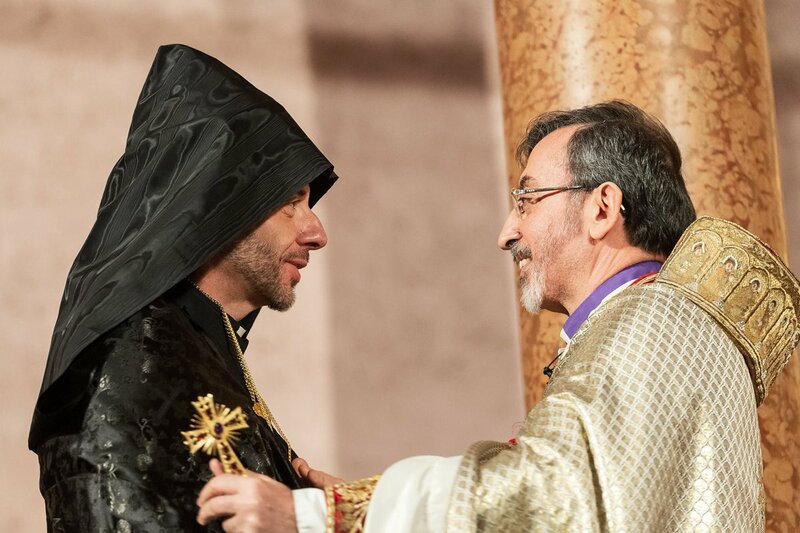 Dr. Daniel Findikyan (Bishop Elect-to be consecrated on May 12th , 2019 in Holy Etchmiadsin) — who was elected by clerical and lay representatives of the parishes at the Diocesan Assembly, which meets annually. The Primate is the Overseer of the Diocese and president of the Diocesan Council, consisting of lay and clerical members, which govern the affairs of the Diocese. Former Primate Abp. Barsamian congratulating his successor, Fr. Daniel Findikyan the first American born primate of the Eastern Diocese. Fr. Daniel presides over St. Vartan Armenian Cathedral in New York City. The Cathedral, consecrated in April 1968 by Catholicos Vasken I of blessed memory, resembles the world’s first cruciform church, the Cathedral of Holy Etchmiadzin, built in the 4th century near Yerevan, Armenia. Adjacent to the St. Vartan Cathedral is the three-story Gulbenkian Cultural Center and Diocesan House. The complex includes a cultural center, museum, library, religious and language departments, office and meeting rooms and various other facilities. The center also contains the Haik and Alice Kavookjian Auditorium, as well as the Krikor and Clara Zohrab Information Center, a research facility dedicated to scholarship and the dissemination of information about Armenian-related topics.